This small tympanum was excavated in Larnaka, Cyprus, shortly before 1882 by the noted archaeologist Cesnola. It must have stood above one of the doors into a church. However, it is far too small to have been above any of the Western doors. Scenes of this sort, combining narrative images with representations of Christ enthroned in heaven were common choices for portal imagery. The person entering the church was encouraged to think about the events of Christ's life, but also about his ever-present nature. 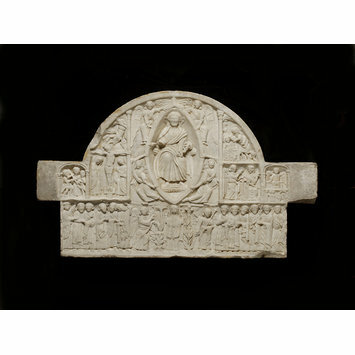 It is likely that the artists who carved this piece had trained in Tuscany, and they were also clearly aware of Byzantine artistic conventions. This piece emphasises that artistic styles did not change overnight - they could co-exist in the same period. The composition of this tympanum owes something to gothic examples. But the figure style, in particular the heads of the Apostles, and the awkwardly twisting postures of the angel figures, show the continuing vitality of romanesque conventions. Tympanum, marble, with a relief of the Ascension. 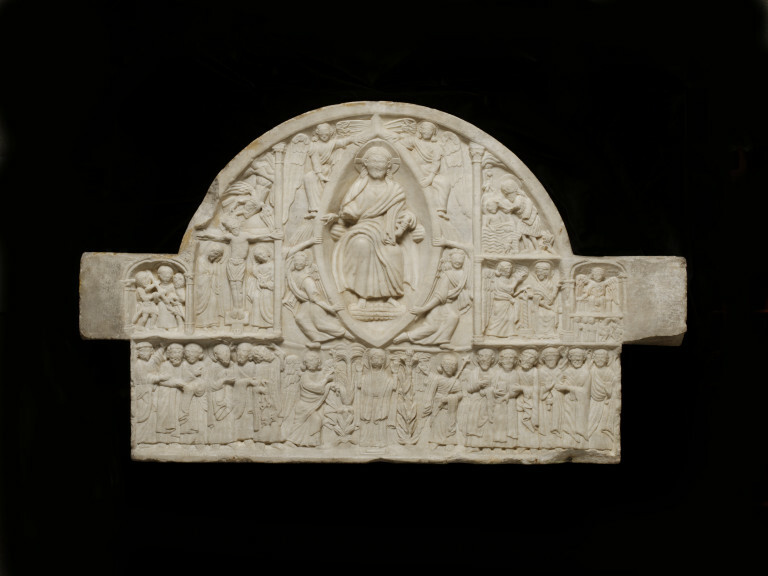 The relief shows the Ascension with the twelve apostles, two archangels and the Virgin orans; other scenes show the Carrying of the Cross, the Crucifixion, the Baptism of Christ, the Annunciation, and the Maries at the Sepulchre. It is not known which church this piece is from. It was first published by the archaeologist Cesnola in 1882. It came to London as part of the Lawrence Collection of Cypriot antiquities, and was sold on to the Pitt Rivers Collection in Farnham. Historical significance: This piece emphasises that artistic styles did not change overnight - they could co-exist in the same period. The composition of this tympanum owes something to gothic examples. But the figure style, in particular the heads of the Apostles, and the awkwardly twisting postures of the angel figures, show the continuing vitality of romanesque conventions. This small tympanum must have stood above one of the doors into a church. However, it is far too small to have been above any of the Western doors. Scenes of this sort, combining narrative images with representations of Christ enthroned in heaven were common choices for portal imagery. The person entering the church was encouraged to think about the events of Christ's life, but also about his ever-present nature. This sculpture was excavated in Larnaka, Cyprus, shortly before 1882 by the noted archaeologist Cesnola. Because so little is known about medieval Cypriot sculpture, this piece has been variously dated. However, convincing parallels have been suggested between this piece and late twelfth century sculpture in Tuscany. The authenticity of this piece was recently questioned by Paul Hetherington, who regards it as a nineteenth century pastiche, but his argument is not wholly convincing.